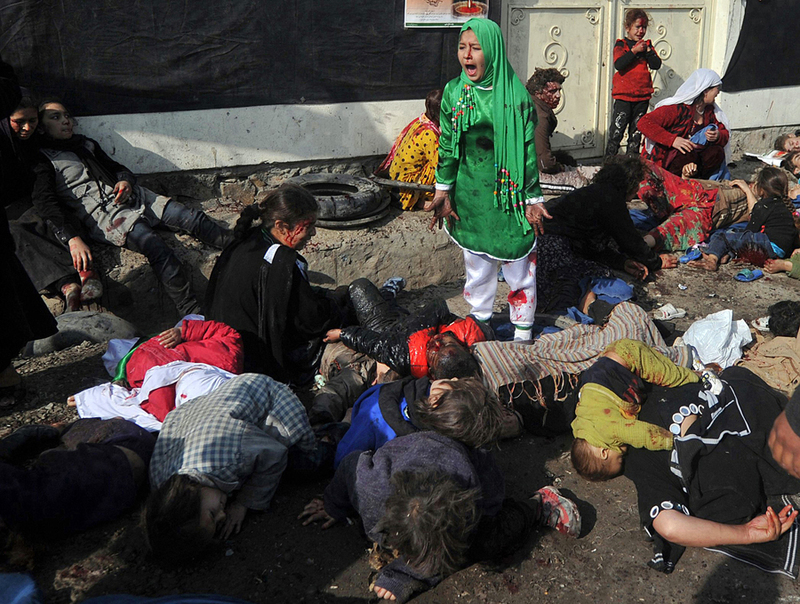 It's best to talk about an image like Massoud Hossaini's Pulitzer prize-winning photo in purely formal terms. I've been staring at this picture for a while. 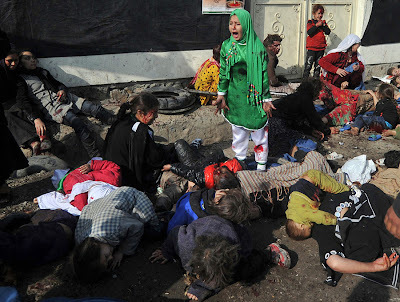 And I've tried to decide what it says about photojournalism, prizes and the war in Afghanistan. But the more I think about its usefulness in socio-political terms, the more dead-ends I reach. We are drowning in pictures trying to convey the horrors of war. There will never be one that succeeds, and this one fails just less than the others. So let's leave aside what the image does or does not do. Instead Let's just look at what it is. It is a photo deserving of its award. It won because it achieved the status of art, with the requisite art historical references bound up in the suffering. It seems perverse, but you are reminded of so many other artworks by looking at this picture. The screaming nurse in 'Battleship Potemkin', Dell'Arca's 'Lamentation', Picasso's 'Guernica'. But like these other greats, Hossaini's photograph is visually and emotionally powerful because it is not extremely explicit in its content. Yes, we see the dead and dying, but they could almost be sleeping. The ground is not littered with body parts, blood or other gruesomeness. The real impact comes from the girl at the centre of the composition who stands virtually unscathed amongst the carnage. She is picked out by her striking green dress in the same way that the torchlight picked out the small girl in Chris Hondros's equally haunting image from Iraq. Is it devaluing the subject to talk about it in these distant terms? Somehow pretentious? I hope not. It is perhaps more out of touch these days to argue that single images like Hossaini's contain some kind of inherent power to change the course of events or influence popular opinion. His photograph, in fact, teaches us nothing more than we already know from seeing thousands of other images of suffering. Instead it does makes me believe Oscar Wilde's view that 'all art is quite useless'. Because it is the very fact that there is no reason for an image like this that makes it so valuable.